To my Jewish friends and neighbors, warm wishes for a happy New Year as you celebrate Rosh Hashanah ... high holy holidays. To make this card at left, I used the Sure Cuts A Lot (SCAL) program to convert the image of a dove I found online. I then cut that image out of the cardstock, saving the off-cuts for use in future projects. I lined the card with a glossy deep turquoise paper from the Mariposa stack. I then created another multicut of the dove using the SCAL program and cut the twigs and leaves from gold glitter stock from the same stack. 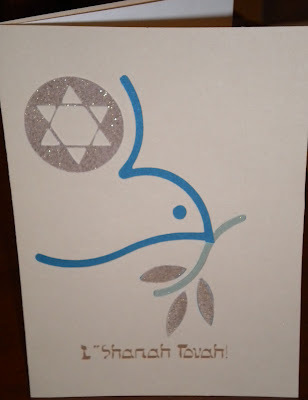 For the Star of David, I used the Cricut "Joys of the Season" cartridge, cutting on a glitter stock as well. I pre-printed the message on the card using my standard HP inkjet printer. Blessings to all, with peace.